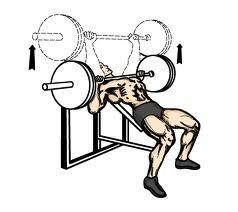 Incline Bench Press is an upper-body lift that focuses on the chest and shoulders. The Incline Bench Press (if you are using a barbell) or Incline Dumbbell Press (if you are using dumbbells) is key to developing a strong upper body. Make sure that starting out, you don’t use as much weight as you would during the bench press. You may be tempted to try the same amount, but the incline bench press is harder because you are using less muscles to perform the lift. Also, the steeper angle makes it harder. Rest on the incline bench with your feet on the ground, make sure you don’t move your feet during workout. Lower the dumbbell or barbell down to the top of your chest without actually hitting your chest. Press dumbbells or barbells back up with elbows to sides until your arms are extended. Dumbbell or barbells should follow a slight arch pattern, between your chest and upward towards your shoulders. Dwayne Johnson, aka The Rock workout, does incline bench press with dumbbells. The Rock does this as part of a pyramid routine. In a pyramid routine, you go up in weight and down in reps each week. 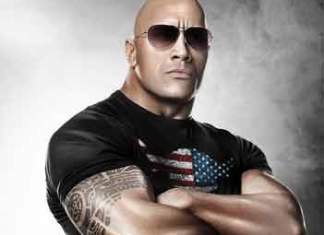 The Rock does: (Both Arm) dumbbell incline bench press and (Alternating Arm) dumbbell incline bench press. The Derek Jeter workout uses the Incline Bench Press as part of his superset workout. Joe Manganiello uses Incline Bench Press during the workout that helps transform him into a Werewolf in True Blood. The David Wright workout uses the Incline Bench Press as part of his superset workout. Alex Rodriquez starts his workouts every Monday with this exercise. The Patrick Willis Homegrown Workout uses this exercise during his Upper body workouts. The Hugh Jackman workout uses this exercise during his Wolverine Workout. He then does a superset with Incline Dumbbell Chest Flys. The Kobe Bryant workout uses this exercise during his 6-6-6 basketball workouts. Kobe Bryant’s off season workouts last over 6 hours a day: 2 hours running, 2 hours of shooting and skill conditioning, and 2 hours of weights/cardio.